My journal of work in Revit as part of a 600+ member architecture firm. Squeezing in one night a week over the last few weeks I've managed to get the new yard operational. 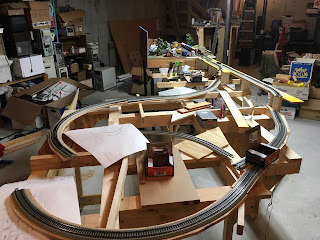 All of the track is not laid yet so I still am lack my three storage tracks, but the arrival/departure, run-around, caboose track, engine track and yard lead/throat are all up and running. I took some time last night to do some switching to see how it all played and I was quite pleased. For such a compact yard it seems to work very well. It was also unexpectedly easy and satisfying to use the throttle to control all of the turn-outs in the yard. The biggest challenge is knowing the turnout number address to control. At the moment I'm cheating and have bits of masking tape with the numbers near the throw-bar. I may consider putting a diagram on the back-drop I plan to mount. This would be a bit un-conventional, but much easier to glance at and still keep an eye on the tracks, as opposed to looking down at a control panel or the fascia. You can see that the A/D track has a train almost ready to go with the switcher still on point. Two cabooses are in their hole and some additional cards (and Thomas) are in storage on the run-around/switching lead. The road engine is sitting on a temporary piece of track which will be the permanent engine track. 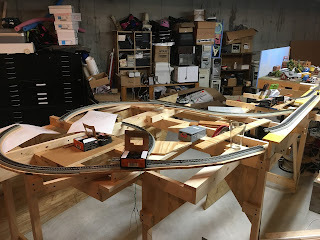 All that is left is the switcher needs to grab a caboose, the road engine can pull the train forward and the switcher will tag the caboose on the end of the train as it leaves the yard for the main. Next goals are to finish up the track laying and get that all operational, then I'd like to get a backdrop in place separating the town from the yard. Once that is all in place I can start in on some scenery while continuing to test the track-work. I'd also like to get some waybills set-up so that I can do some basic operations between the yard and town. I achieved my goal of a fully continuous running loop by Christmas. It did require building a quick open grid frame on top of a couple of saw horses, with a sheet of plywood, but at least it works! 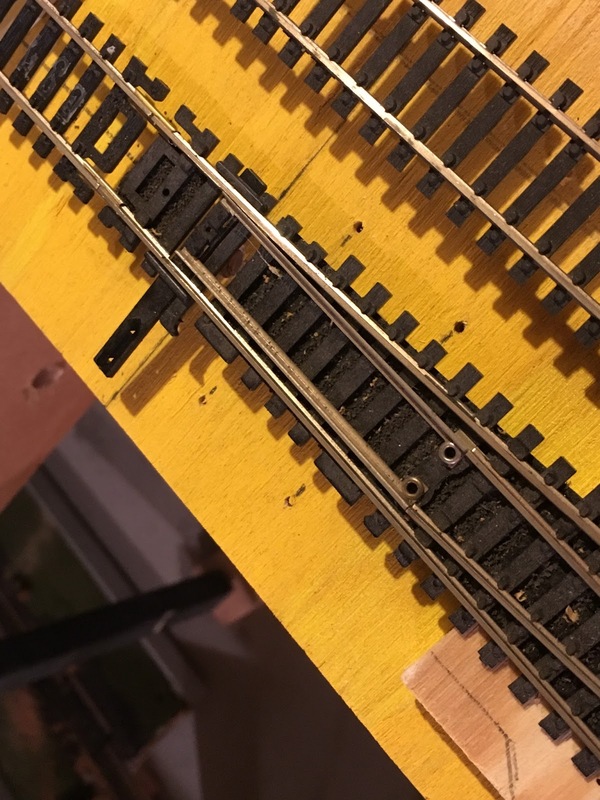 The loop on the table top currently provides an additional siding that can be used for spotting cars at industries and a return back out to the mainline. Lacking any better ideas, I started labeling wires with "T" for "Town" and have since decided to refer to my town as "Taunton" (a local town here in eastern MA). The module portion is referred to as Taunton, while the extended siding is referred to as "East Taunton". In addition for Christmas I also got Thomas up and running complete with custom sound effects for his whistle, and two sayings from the TV show. In addition to squeezing a decoder and speaker into tiny little Thomas I also found space for a tiny "keep alive" capacitor to handle trouble areas like turnouts or slightly dirty track. Check out the video! Apologies that the first part is a bit shaky. 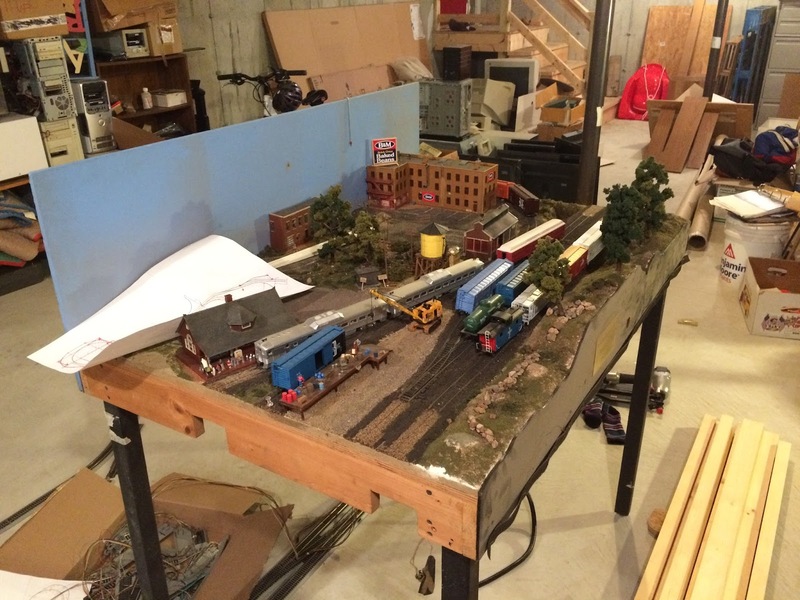 Lastly, I've resurrected the staging yard from the old layout I de-constructed last summer. At first I thought I would keep the turnouts as is, but the more I looked at it I determined that I'd prefer to make the yard functional from a switching perspective and not just a straight staging yard. So I ripped up the turnouts and have re-laid most of them and planned out the remainder. 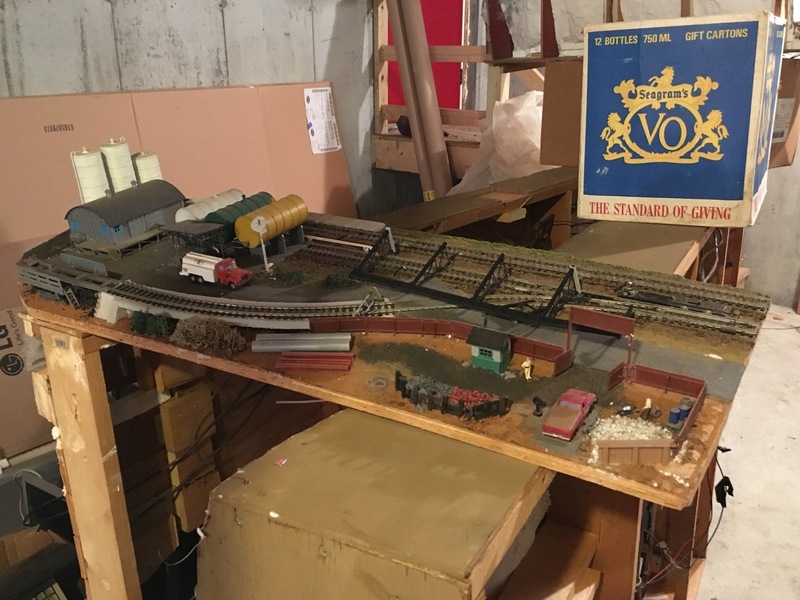 The improved yard provides two tracks that can be used for arrival and departure, a run-around, two classification tracks, a yard lead, caboose and locomotive storage. In the picture the classification tracks are buried under materials and the yard ladder and engine track have not yet been laid. Redoing the yard also gave me a chance to look into stationary decoders to drive the turnout motors (all Tortoise under-layout mounts). I've picked up two Digitrax DS64s that give me control over all of the turnouts in the main yard. I think my new best friends are Ebay and my parents' Brother Label Maker. Both have been critical in getting the yard up and operational! Additionally for power management I've started implementing a PM42 Power Manager from Digitrax. This allows me to break out the power from each of my two boosters to two separate districts for each booster, additionally I can set the sub-districts to be auto reversing, rather than having the boosters themselves set to Auto Reverse. This way each booster can power an auto-reverse section (which should generally have no more than one train in it) as well as another larger portion of the layout, distributing power more effectively. Once the yard is on-line, I want to get a back-drop installed between the yard and Taunton. 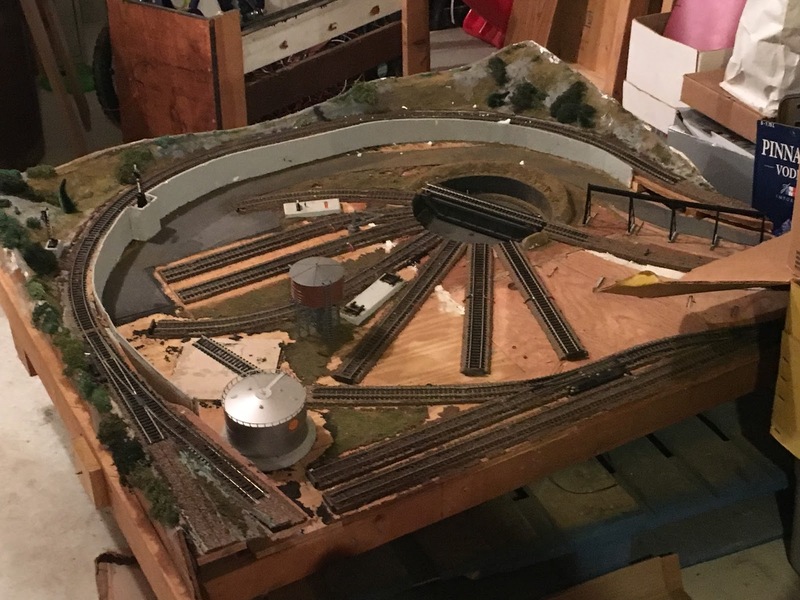 After that I hope to start on scenery around the track that goes from Taunton to the yard. Not as much as I wish... Lots of things going in life, but in the last week+ I've found a few moments to put some time in. 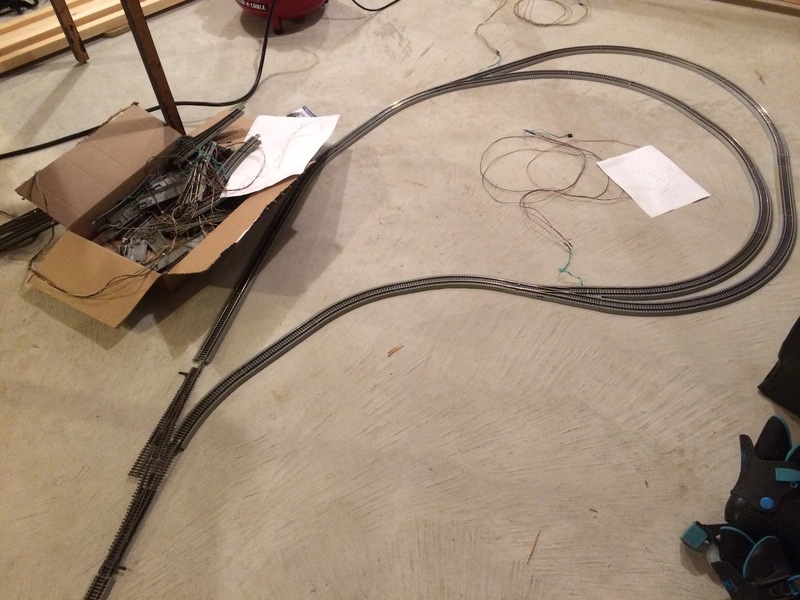 I was able to rig up some temporary wiring and thanks to the acquisition this summer got a DC locomotive up and running on temporary track. Lorenzo loved it. 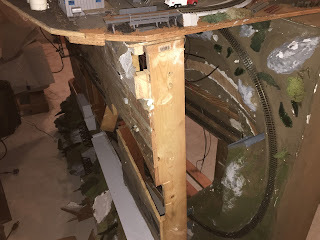 Sub-roadbed has been cut for the next sections and test fitted (as you'll see in the pics). The other big news was that new LED shop lights went up, you'll not the change in color temperature in the pictures ($15 @ Ocean State Job Lot, how can you not take that, even if they die in four years...). The new sub-roadbed is 15/32" plywood, a bit more rigid which should be good for the curves. I ended up re-enforcing the thinner 3/8" plywood I used originally as I was not satisified it would stay flat. 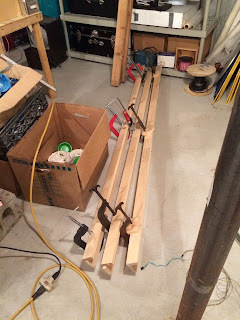 Some scrap pine and maple did the trick with some wood glue. Lastly I've had to think some about electrical blocking as I will need a reversing section since I have a return loop. Currently it looks like my max train length will be ~6 1/2'. This should be ample given the size of the current layout and I can do thinks like put detection on cabooses with DCC decoders or resistors for signaling, automation and full train detection, etc. in the future. Till next time; toot, toot! New sub-roadbed test fit with track. pre-drilled holes for mounting switch machines underneath. This straight-away leading into the reverse loop will be the auto-reverse power block. Construction Delays, but expansion proceeds! Two large sections of mainline. So, good weather finally showed up which means construction has come to a stand-still (ironic for a railroad, right). Taking a page from the company I work for the Railroad has decided to expand further via M&A activity! 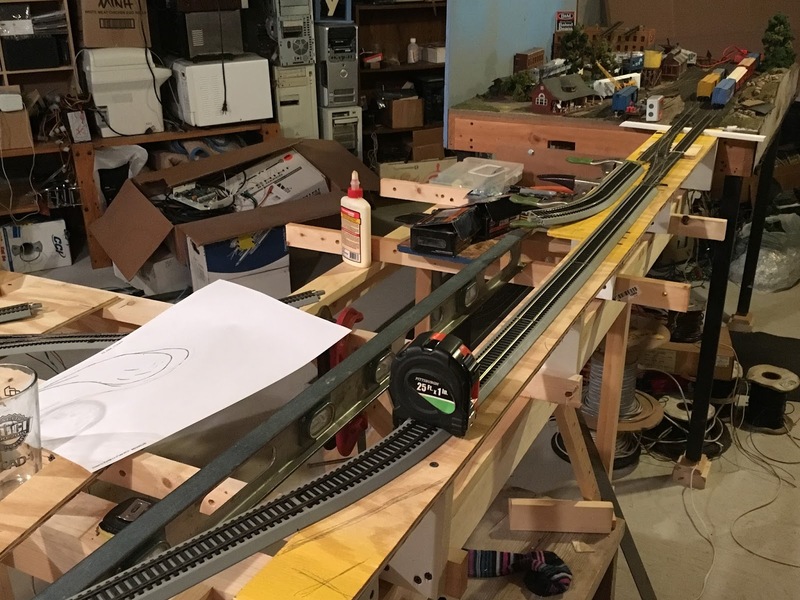 That's right, our little railroad has doubled in size thanks to the acquisition of all track and properties belonging to a neighboring railroad. The railroad had laid dormant for some time and there was some damage incurred on moving from its original locale to the the house, however the bones are solid and we're looking forward to integrating it into the current plan. We're most excited by the addition a medium size stub end staging yard as well as a small engine terminal featuring a small turntable (scratch-built no less). Looking forward to getting the first loop of track laid and running, then figuring out how to integrate the new portions! Still need to add a few more gusset plates for lateral re-enforcement but in general its quite sturdy for being made out of 1x2s! Lorenzo was happy to walk on it like a balance beam (holding hands of course). My plywood triangular gusset plates are courtesy of a Canstruction project a few years ago. 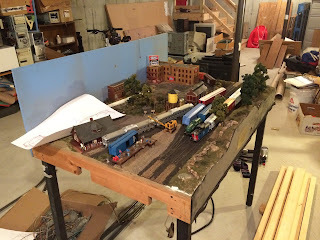 Knowing that I would be building a Model RR some day I had the foresight (and spare space in the basement) to save the scraps (of course being the one with the truck I also have all the original pieces after we took down the can sculptures :-) ). 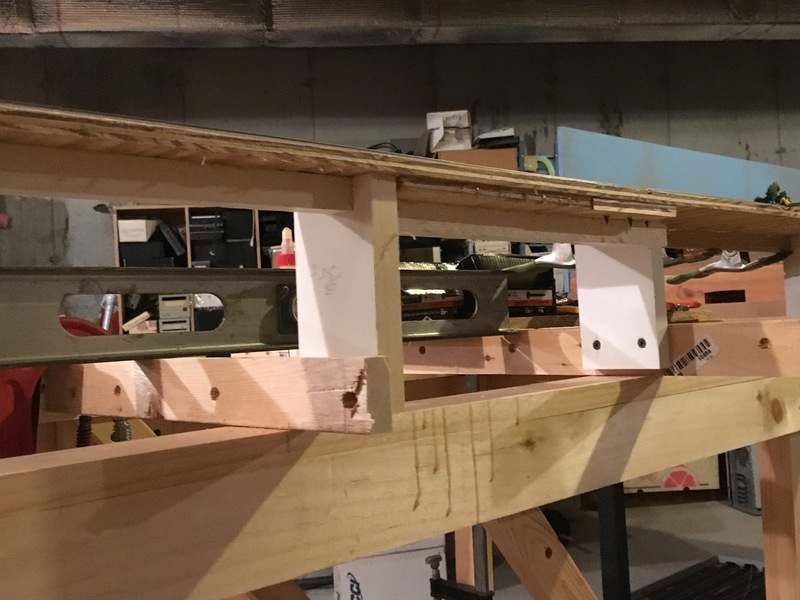 Once the final bracing is in place I'll bolt the new benchwork to the existing module and I'll be ready to start laying out and cutting sub-roadbed. I'm cautiously optimistic that I'll have (limited) running trains by sometime in July, if not summer vacations and conferences will likely put further progress on hold until late summer... :-(. So what did happen; lots of things. Mostly I felt like I ran out of useful topics around Revit and/or the more interesting stuff couldn't be shared for various reasons. More recently you can read my Design Technology focused thoughts as part of the Design Technology Summit blog posts here. 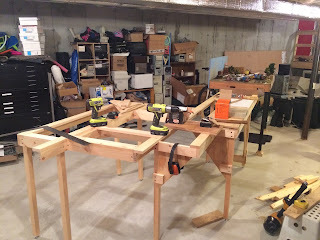 So what should I do with this blog; well there are other things in my life besides Revit (no way!!!). Among them I've always had a passion for model railroads, and now that my nearly two year old son seems just as excited (I should add my 6.5 yr old daughter also likes trains, but that rascal.....) I'm diving back in! 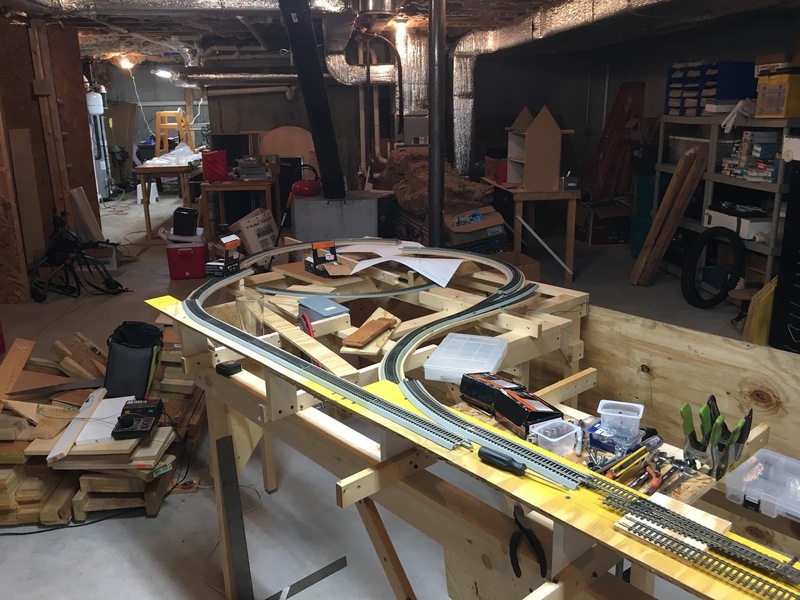 So I'm moving forward with designing a model railroad, its a great hobby I might add for lots of people, whether you have a more artistic bent or engineering/electronics/design there is quite literally a little bit of everything! 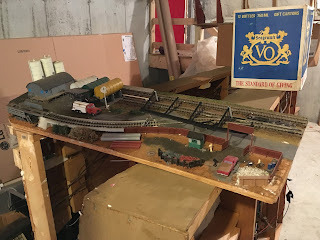 That all said I'm getting out of my armchair of having read Model Railroader for the past two decades and I'm actually going to do something about it! 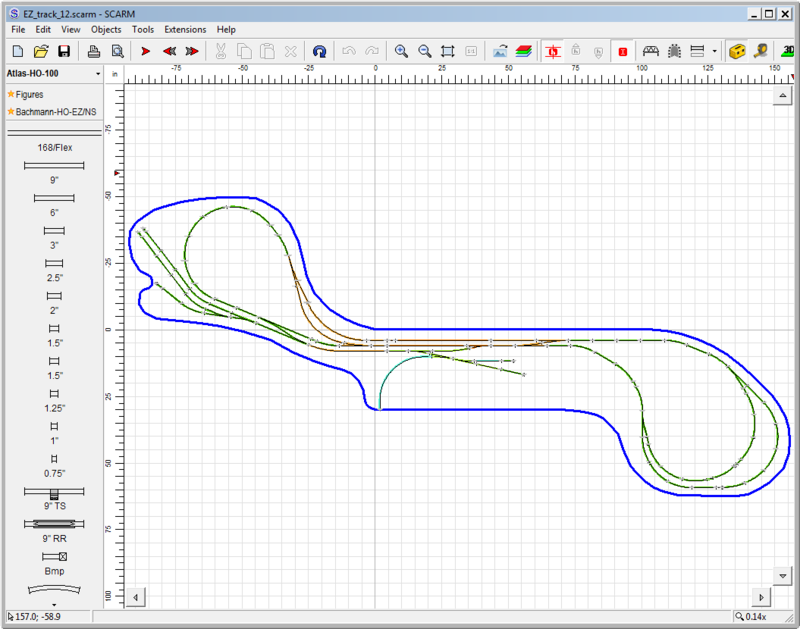 I've resurrected my old HO scale module and have planned a simple dog-bone track-plan around it. The last couple of Christmases the kids received some cars and engines from Santa as well as a bunch of Bachman E-Z Track sectional pieces. 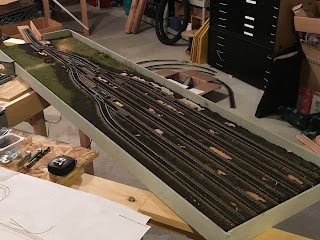 Since that was a pretty big investment by Santa (and no its not me) I decided that while not my first choice, I might as well use the E-Z track as it would get me to "market" more quickly with not having to laydown roadbed, spike flex track, etc. So I found what I think so far is a pretty neat little track planning tool that gets the job done SCARM; it even has a train simulator, so you could just live in the virtual world forever. While there are other software packages out there (that have been around since the 90's) I really like this one (did I mention its free?). 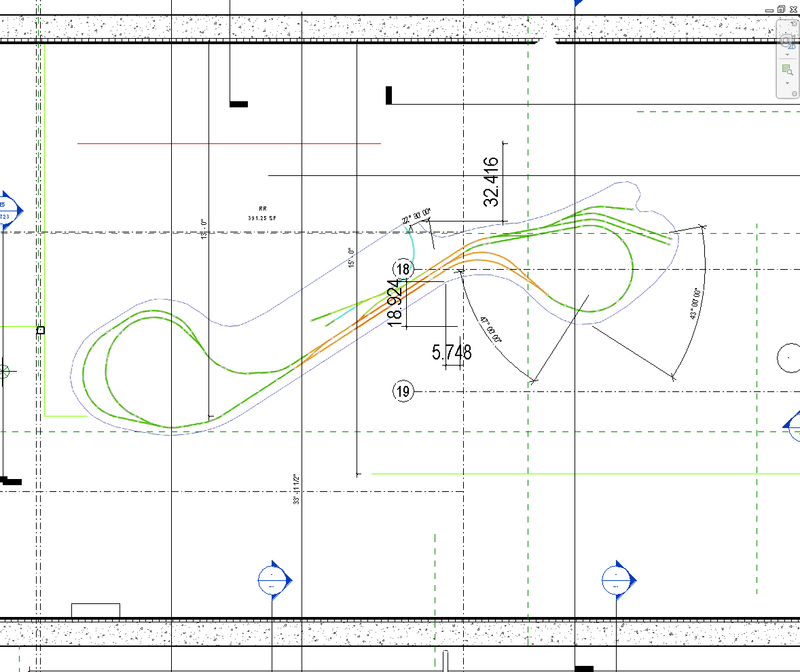 Admittedly the "Simple" in the name is a bit too true for a BIM junky like me, but it gets the job done, and in the realm of track planning, it is BIM for track planning, as you can print out a parts list! Of course, I also found a way to work Revit into the mix. 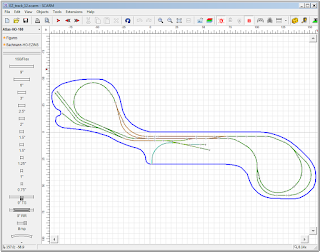 I used that to design and plan the benchwork to support my wonderful track-plan. 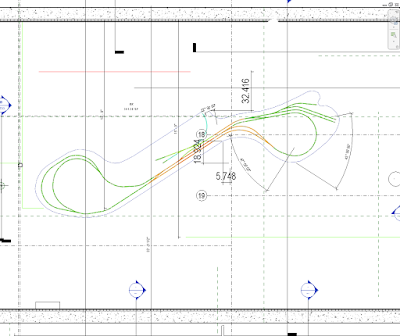 A little hi-jinx with images got the track plan into Revit at scale so that I could make sure things were lining up "close enough". 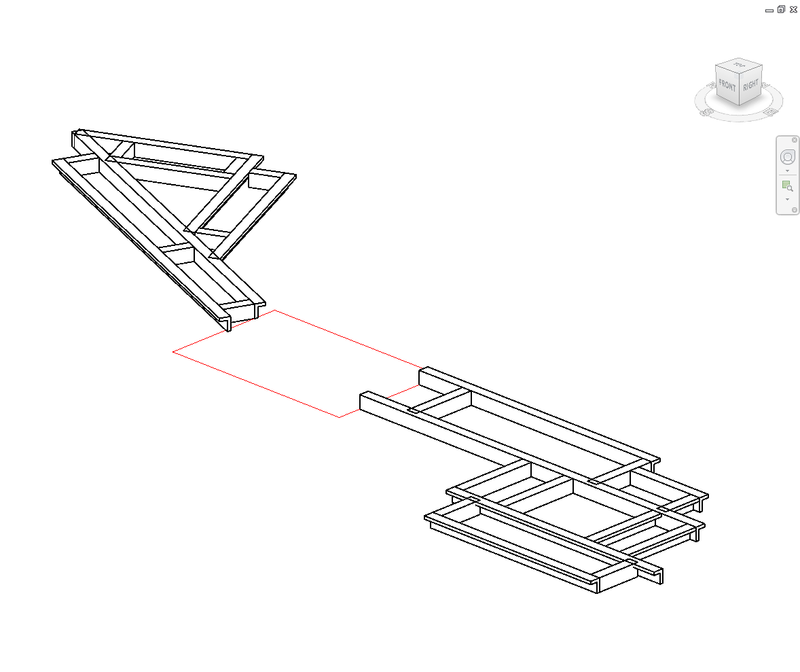 I could also make sure it would fit properly in the basement thanks to having a Revit model of the house! 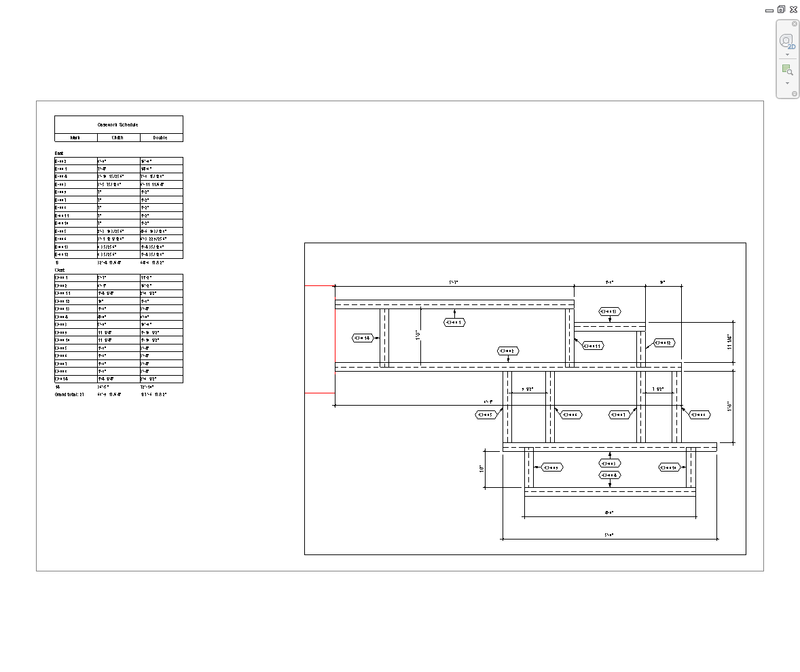 Of course I also used Revit to create a quick sheet with dimensions and a schedule. Thanks to a handy renumbering tool I could key each instance to the schedule. The end result? After $100 at the big Orange Store, as of tonight three girders are nailed, glued and drying (ran out of clamps) and the west end of the track plan has been fitted and tested (the beauty of snap track). With some luck I'll keep the updates coming. Stay on track! So I think the news it out already, but Harry Madison (one of the most talented Revit API developers out there) has started his own blog and consulting business for developing Revit API tools. 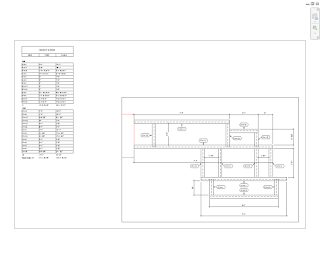 He has put out a freebie on the Revit Exchange "Image-O-Matic". Which is a nifty little tool to generate an animation of a parametric family. There are a number of interesting possibilities with this tool, you could make a cool family such as the one Harry used for his demo. However another interesting possibility with this tool would be to demonstrate how a family works for the purposes of educating users on how to properly use a family in a project. So on top of all that he is running a contest until the end of the month, the winner will get a free tool of their choice (some restrictions apply) if they win the content. To win you have to provide the best example of the use of Image-O-Matic. On another front, I'm working closely with Wes Benn (chairman of RTC), some of the North American committee members and some other folks from the industry for something special at RTC NA 2013. No other details to share yet, but stay tuned! Comments on this blog are moderated to prevent SPAM comments. There may be a delay from when you post to when there is time to review and accept your comment. Thanks for your feedback. The comments and blog entries on this site represent the viewpoints of the author only. The information given in this blog should be considered for informational use only and any readers should independently verify any results.